Malaysia Airlines Flight 370: Why didn't the passengers phone for help? 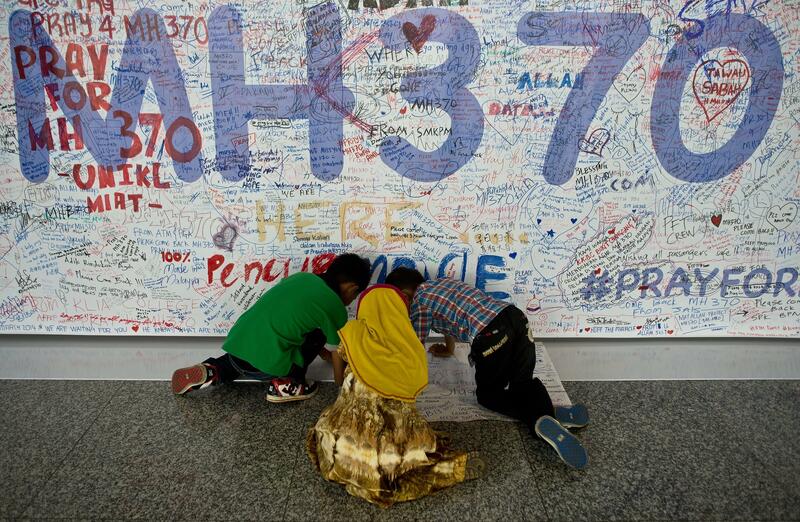 Children leave prayers and well-wishes for passengers onboard the missing Malaysia Airlines flight at Kuala Lumpur International Airport in Sepang on March 17, 2014. One of the most commonly asked questions we’ve received from Slate readers is: Why didn’t the passengers aboard missing Malaysia Airlines Flight 370 use their cell phones to call for help? We all remember United Flight 93, whose passengers communicated with the ground by phone after the plane was hijacked during 9/11. Given how famous the incident subsequently became, it’s hard to see why none of the 227 passengers aboard the Malaysia Airways flight attempted something similar. One part of the answer is that, at least at first, many or all of the passengers might well have been oblivious to the fact that anything was awry. There is no evidence that the takeover of the plane was violent; the view has become increasingly widespread among investigators that the captain himself diverted the plane. By this time, it was past 1 a.m., and many passengers were no doubt asleep. Apart from the lights of the occasional ship, the sea below would have been completely dark. In such a situation, without visual reference or navigational instruments, it is almost impossible to determine one’s orientation. The only way a passenger could have detected a change in course is if he happened to be watching the plane’s course on the entertainment system—but the cockpit can shut that down. “There’s the circuit breakers for all that stuff,” says retired 777 captain Gerard Baer. Some reports indicate that after the plane turned off its transponder and changed course to the west, it climbed sharply to 45,000 feet and then descended even more abruptly. If true, such maneuverings quite conceivably might have alarmed the passengers. But it’s hard to know how much weight to give the altitude-deviation reports, since it seems unlikely that a fully-loaded 777-200ER can reach such an altitude and flat-out impossible that it could have descended so quickly. So the data might have been produced by faulty instrumentation. At any rate, once an airliner is at 30,000 feet, cell phones no longer work. “At 3,000 feet, you can make a call, but go much higher and you can basically forget about that,” says Wouter Pelgrum, an assistant professor of electrical engineering at Ohio University. “You don’t have coverage.” Part of the problem, he says, is that cell tower antennae are pointed down, toward the ground, not up into the sky. If you’re over a city, with its dense cluster of coverage, you’ll have a decent chance, but not in a rural area, and even less so over the ocean. So what about the United Flight 93 passengers? Most of their calls were made using GTE AirFones, a technology no longer in use that relied on radio waves to communicate with the ground. Malaysia Airlines offers a “air-to-ground phone” service in business class that also allows passengers to send email, but the captain can shut this down, too. Only in the later stages of United Flight 93, when the plane was nearing Washington, D.C. and below 10,000 feet, did a few cell phone calls manage to go through. Recent talk about the FAA allowing cell phones in flight depend on the airlines installing another technology, so-called “pico cells,” which are basically miniature cell phone towers located within the plane that then relay the signal to the ground. Flight 370 appears not to have been equipped with this equipment, however, and even if it were—you guessed it, the pilot could have shut it down. One reason for this lack of pinging might be that the passengers all had their phones in airplane mode, and it never occurred to them that something was amiss. If the plane’s final destination was near Kyrgyzstan, it would have landed within an hour of dawn, giving passengers little time to notice that something was wrong with the landscape outside their window—and by the time they did, they might have been over sparsely populated landscape with little cell phone service, and/or at low altitude, where electronic transmissions of any kind would have been hard to detect. And if the passengers did notice that something was wrong earlier in the flight, and began to take action, the pilot could have taken swift action to silence them. “The pilot can raise the cabin altitude [meaning, reduce the pressure to match that of a specific height above the ground] up to cruise altitude,” says 777 pilot Rick Solan. In essence, the pilot can depressurize the cabin, which at 30,000 feet will cause passengers to lose consciousness within seconds unless they grab their oxygen mask (which will automatically deploy if the pressure drops to such an extent). But sucking air from a tube will keep passengers immobilized in their seats, and at any rate the chemically-generated oxygen will run out after 15 minutes. That’s a depressingly grim scenario, however, and there’s good reason to think that whoever took MH370 would be strongly motivated to avoid it. If the most obvious motive for abducting a planeload of Chinese nationals—ransoming them for political leverage—is indeed the correct one, then killing them would defeat the whole purpose of the mission. Given the cunning strategy of the plan’s early phase, it’s more likely (assuming that the flight didn’t end up ditching in the southern Indian Ocean) that he was able to keep the passengers quiet the way that airline pilots all over the world do every day: by exerting his authority as captain and offering a plausible-sounding explanation for the rerouting and delay.